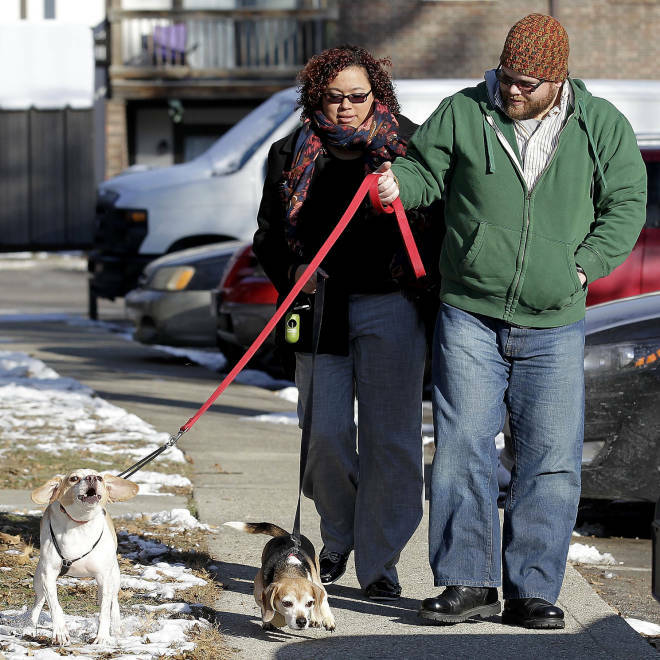 Harmony and Christopher Glenn walk with their dogs in their Indianapolis apartment complex. The Glenns are part of a growing population stuck paying down debt for a college education they never finished. The Glenns are part of a growing population stuck paying down debt for a degree they never got. According to a 2011 study by the Harvard Graduate School of Education, only 56 percent of students who enter four-year programs graduate within six years. That number plunges to 22 percent for for-profit colleges. Meanwhile, the percentage of incoming students relying on loans is growing—from 2001 to 2009, the number increased from 47 percent to 53 percent, according to a report by Education Sector. The same report also found that borrowers who drop out are four times more likely to default on their loans. Some of these dropouts grew up middle class with an expectation of getting a degree, like the Glenns. Others are students from low-income backgrounds, perhaps the first in their families to go to college. Michelle Obama recently launched an effort to encourage these first-timers to pursue higher education, but the odds are stacked against them: Pell grants and funding for state and city universities continue to shrink. Forty percent of students at four-year colleges, and 60 percent at community colleges, are working 20 hours or more to make up for these gaps, according to the Pell Institute. This maze of red tape caused Hector Gonzalez, 30, to drop out of college more than a decade ago. Gonzalez—who was born in El Salvador, raised in San Jose, Calif., and didn’t have a green card—couldn’t get a straight answer as to whether he qualified for loans. When a private Christian school in San Diego finally approved him, he got $6000 from the Free Application for Federal Student Aid for each semester, but halfway through the spring, school officials told him he didn’t qualify after all. He tried working three jobs for the rest of the semester in order to pay the tuition, but it wasn’t enough. Twelve years and a chunk of interest later, Gonzalez still owes money to the school and on his FAFSA loan. And neither are for-profits, where one-fifth of the nine million yearly Pell grant recipients end up matriculating, according to an Education Trust analysis of federal education data. Mary Nguyen, an analyst at Education Trust who led the Education Sector study last year on students who drop out with debt, found that many students choosing exorbitantly expensive for-profits don’t know the difference between a for-profit college and a regular one. They enroll “based on inadequate information,” overwhelmed with “the confusing array of choices,” she said. After two years of uneven teaching quality—“some of the teachers didn’t quite know what they were doing”—Scott concluded he wasn’t getting his money’s worth. He left the program earlier this year, owing $30,000 to the government and $15,000 to his parents. Scott now lives in Seattle and makes $11 an hour working part-time at a game-testing job. “I definitely didn’t need to go to school” to do this job, he said. Scott has yet to mail in a loan payment, but others have gotten used to the stack of monthly bills. Rich Bisset, 25, a sales associate at an electronics store in Jersey City and the first in his immediate family to go to college, budgets $700 every month to various student loans. He owes $60,000 after a few semesters at Farleigh Dickinson, a private university, and then a cheaper stint at Rutgers University. He dropped out because he was working too much, and his grades plummeted as a result. Bisset hopes to return to school “when my finances are more stable,” but Harmony Glenn is fairly sure she’ll never go back. “I never assumed [retail] would be my career,” she said. “I always assumed it was what I was doing until I finished my degree.” Becoming a manager at the skin care store would help her pay off the family debt, while going back for a political science degree promises her nothing. Both Glenns do worry about what their parents think; their families stressed the importance of college early on. Harmony “walked into kindergarten knowing that what came after high school was college.” Christopher’s father, just 18 when he was born, tried to steer Christopher away from his own profession as a paramedic because of the low pay. His father worked two jobs so Christopher’s mother could go to school, and she’s now a city comptroller.